Let’s face it: sometimes, the world of academia can be, well, boring. And while the classroom isn’t the first place most people think of when talking about fun, it’s an excellent place for stretching those creative muscles and for exploring critical thinking in energizing ways. Especially since we compete with different forms of technology for our students’ attention, it’s essential that teachers are engaging students with hands-on and reflective processes so students are tapping into deeper, meaningful learning. When we can see what we’re learning connected in reality, it really reinforces the lesson, and this is the idea behind forging that connection for students. It can be done by bringing in materials across disciplines, helping students notice the overlap, or it can simply be a way to keep your students interested in your subject. Nonfiction stories – for example, using a history in English class about how Abe Lincoln once jumped out of a window to halt the passing of a bill, or the inventiveness of Nikola Tesla in a history lesson, can be both amusing and an anecdotal way to present content. Activities using material from the larger world are also engaging, such as a lesson on budgeting and price comparison strategies by having students set a budget and try to get the most for their money by comparing prices of competing grocery stores. Or have students practice playing the stock market, where they choose a stock with a set figure of money and track its movement for the year. What historical sites can students visit if they were to buy a ticket on Amtrak? Bringing the real world into the classroom gets students exploring something that they could potentially experience later on. Student engagement starts with the important role teachers play in fostering students’ “buy in” with learning. 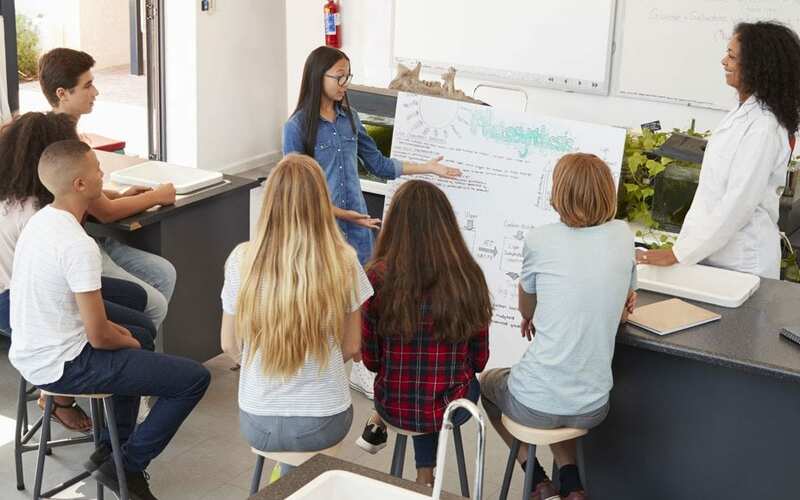 Teachers create the environment for deeper learning by setting up experiences for problem-solving, working in groups, and long-term assessments, like student portfolios. And sometimes creating a project centered on student engagement provides chances for them to experience what really goes on in life. One example of this is the student exhibition. If your class prepares for a presentation in an exhibit hall, they experience giving presentations, working under a deadline and collaborating with a group. Are all very impactful learning moments and build skills that will benefit them later in life. A great idea for practicing performance skills comes from a very non-boring approach to poetry.Yes, poetry; you read that right. In Lance Fisher’s class, students are encouraged to recite other people’s poems, practicing out loud, standing – sometimes shouting – at the walls around his buzzing classroom. Developed by the national program Poetry Out Loud, this active way of performing has students practicing skills such as acquiring a deep understanding of text structure, understanding the author’s purpose, building vocabulary, and connecting to written language. Foreign language teachers can also easily adapt this lesson, focusing in on building vocabulary or pronunciation. Parlez vous Francais, s’il vous plaît? Another great way to explore reflection with your class is built right here in Gradelink. Creating Teacher Pages makes it easy to keep your whole class up to date with personalized web pages for teachers to use as announcement boards, newsletters, class/course pages, and more. You can add and edit content anytime, including text, pictures, and links for file downloads. Pages can be made viewable to parents when they log in to Gradelink and embedded directly onto your school’s website. One of the best aspects of teaching is that moment when you can see that what you’ve prepared has sparked your students’ creativity and critical thinking skills through engaging classroom content. And it’s true that this isn’t happening one hundred percent of the time; that’s what makes these moments so special, and that’s what makes them so memorable. As we march on toward December and look forward to the new year, may you feel inspired to keep the energy flowing.